Gambian parliament picks female lawyer as new speaker – Royal Times of Nigeria. The Gambia has a new speaker of parliament. The new speaker is in the person of Mariama Diack Denton. She takes over from Abdolie Bojang whose tenure expired ahead of the April 6th legislative polls. Mariama, a nominated member of the new parliament is also a lawyer. Her candidacy for the top legislative post was supported by President Adama Barrow and four other members. 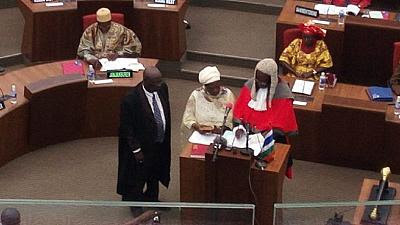 She was sworn into office on Tuesday by the Chief Justice of the Gambia during the opening of the new parliament. She said; “I will do my best to live up to expectation. I shall at all times endeavour to uphold the provisions of the Constitution and the Standing Order of the National Assembly in the performance of my duties as Speaker. “I will be impartial as expected and maintain the dignity of the office. I look forward to working with all sides of the Assembly and ensure that the welfare of the people is the priority,”.